country apples., a photo by lara sheleheda on Flickr. Our garden isn't particularly big but it does house a plum tree, a pear tree and a cherry tree. Unfortunately this doesn't really excite me a lot as I really don't know what to do with the plums and I don't actually like pears that much. Luckily I hate cherries because if I liked them I'd be disappointed. The birds always get to them before they are even ripe. What I would really like to have in my garden is an apple tree. 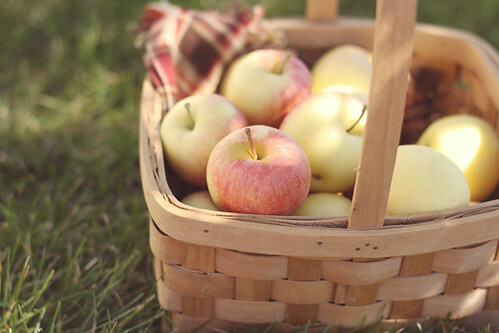 I would love to be able to pick a basket full of lovely juicy apples just like in this gorgeous photo. I don't know what else to say about this picture other than it is just lovely and really sums up all the good things about early autumn.